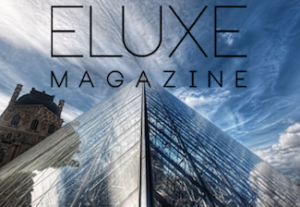 We can now add yet another source to the growing list of important publications that have already spoken out about the critical climate engineering issue, “Eluxe Magazine”. Below is an excerpt from their impressive “about” section. Follows a strict Corporate Sustainability Policy, with transparent annual reports. Other publications that have already done their part to sound the alarm on atmospheric spraying atrocities are SOCO magazine and National Health Freedom magazine. The wave of awareness and outrage is building very rapidly as people around the globe wake up to what has been done to them without their knowledge or consent. Momentum is growing exponentially in the most critical battle of all, the fight to take back our skies from the grip of the collective insanity that has all but decimated our planet. We must all keep marching forward in this battle with all the strength and speed we can manage, every day counts. My most sincere thanks to Eluxe Magazine for solidly joining us in all important effort to expose global climate engineering. Many of us have looked up to the sky and seen something a bit unusual these days: fat and thin white puffs in strange patterns. They kind of look like contrails, the vapor given off my planes. But they last much longer. And they spread out. And they seem to be in odd patterns…. 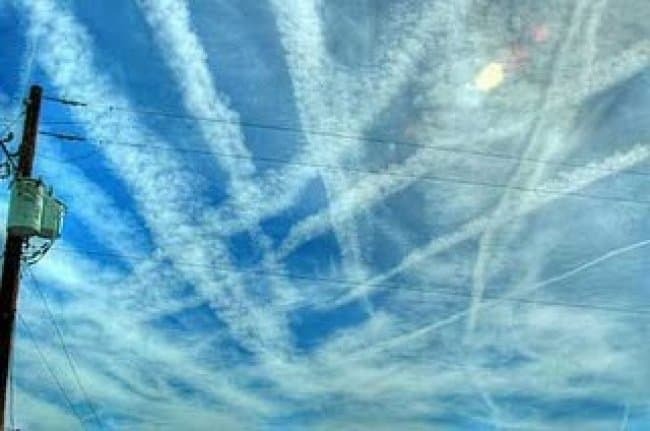 These are not, in fact, contrails; rather, they’re “chemtrails,” a knock-off of the word “contrails.” Contrails are trails of condensation that can be seen in the sky when a jet airplane is traveling at above 30,000 feet altitude, where the air is thinner and colder — very cold. Outside temperatures can dip to minus 60 F and the air is often full of minute ice crystals that hang suspended and invisible. When these ice crystals get sucked into a hot jet engine they turn into a gas, like steam, and can be seen as puffy white cloud-like lines that follow behind the jets. They usually dissipate and quickly fade away as the moisture once again returns to form invisible ice crystals. Chemtrails, on the other hand, are something different. First of all, they are found at much lower altitudes. Secondly, they linger in the sky–sometimes for several hours. They tend to exhibit a slight rainbow spectrum if lit just right from the sun, and are laid out in strange patterns that wouldn’t make sense if they were from planes. 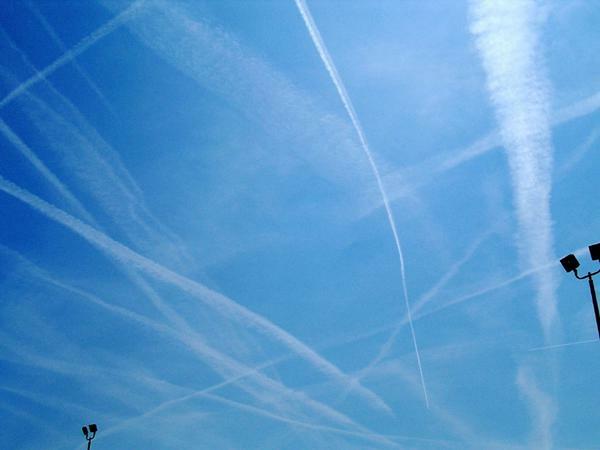 Initially, it was thought that a dramatic increase in air transportation was leading to more and different kinds of contrails in the sky, but increasing evidence is pointing to something far more worrying: a deliberate attempt to introduce cloud-like formations in the atmosphere, restricting our sunlight and poisoning us with chemicals. It seems so outrageous to claim such a thing–that airline companies and governments are poisoning our air with chemicals–that anyone who claimed so was instantly labelled a ‘conspiracy theorist’. But journalists and scientists have been sounding the alarm bells for almost 30 years. In 1997, journalist, William Thomas wrote about chemtrails, and possibly coined the phrase then too. He noted that aircraft were making white lines and flying in unusual ways — often in zigzag patterns or making multiple parallel lines of white trails that tended to expand and eventually cover the sky with a canopy of clouds. Initially, people began to question the government, thinking it was some kind of weather control project, but NASA and of course NOAA and the military have denied any knowledge or involvement in the phenomenon. But independent scientific researchers, convinced that something was going on, have tested groundwater and found that heavy metal levels are unusually high throughout Europe and North America; so high in some places they are changing the pH levels of the soil and are killing off animals and plants. Yet still, the governments of all countries ridicule the idea that there is anything unusual happening. In 2008, samples around California’s Lake Shasta and the Pit River Arm tributary were tested in a State Certified Lab following weeks of fly-overs and chemtrails. The results of the water samples showed 4,610,000 parts per million of aluminum — that’s 4610 times the maximum contaminant level. At another pond, filled with filtered water and confirmed to contain “0” aluminum, test revealed 375,000 parts per million of aluminum (375 times the maximum contaminant level) after only 18 months exposure to the aerial spraying. The usually pristine snow pack from the Ski Bowl area of Mt. Shasta showed 61,000 parts per million of aluminum. But that’s not all. Integrated medical doctors who test people for heavy metals as part of their routines for detoxification and wellness regimes in European spas are finding that virtually all European and American clients are very high in aluminium…whilst clients from Russia and Arabia are not. At first the logic of putting fine particles of aluminum in the atmosphere seems bizarre. Why would anyone do this? But a little research reveals that this plan was considered necessary many decades ago. In fact, the idea of spraying aluminum oxide from jet aircraft was patented by Hughes Aircraft in 1990 (see patent #5003186). The plan proposed “to seed the metallic particles was to add the tiny particles to the fuel of jet airliners, so that the particles would be emitted from the jet engine exhaust while the airliner was at its cruising altitude.” This was ostensibly to help curb global warming. You would think that the government would be happy to announce that they had a plan to help reduce global warming. If spraying powdered aluminum oxide from jetliners would stave off the dire predictions of violent storms, melting icecaps and rapidly rising ocean, most people would likely have applauded their attempts. There would have been no need for secrecy and denying what people have been seeing in the skies over their communities, right? But there’s a darker reason for these chemtrails. It was the late Edward Teller, a member of the Manhattan Project and father of the Hydrogen Bomb, co-founder and director of the Lawrence Livermore National Laboratory, who proposed this geo-engineering technique together with Roderick Hyde and Lowell Wood. He also designed a variety of mixtures according to the specific tasks they have to perform, among which figure the deployment of “electrically-conducting sheets” or “metallic ‘nets’ of ultra-fine mesh-spacing” in the stratosphere. But their concern wasn’t global warming. It was the growing dependence on, and vulnerability of semiconductors. In a paper presented to the US Air Force titled “Electromagnetic Pulse Threats in 2010″, Major Colin R. Miller describes the dangers from atmospheric radiation which could shut down every form of electronic communication in America. Disruption of semiconductors could cause everything to just stop — from the basics like water and power to emergency services, all communications, transportation and national security. He outlines vital importance of shielding of these circuits, both individually and globally. Since the 1950’s when silicon and germanium transistors were suddenly “discovered” by Bell Laboratories, electronic circuitry has become entirely dependent upon these semiconductors. Radios containing vacuum tubes were replaced by transistor circuits and expensive room size computers, which used magnetic relays and solenoids, were quickly reduced to desktop “appliances” that are now found in most every home. As we round the corner of the first decade of the 21st Century, micro-circuits are in our cellphones, satellites, “fly-by-wire” cars and almost all of the communications devices used by the financial, business and military institutions. In just 50 years since their introduction, semiconductors have become a most vital part of our life and a necessity for our survival. But there’s a problem no one anticipated. Because the circuits are so incredibly small and function of such extremely low voltages, they are highly vulnerable to outside radiation. Rays from our sun, the atmosphere and even cosmic rays, can and do cause errors in these circuits that can have an impact on the lives and safety of everyone. One of the problems related to semiconductor technology and as derived from some of its specific characteristics is, that upon exposure to various types of particles of atmospheric radiation — alpha particles, various ions, protons, and neutrons which can ‘hit’ the device — it can change state or alter its output, leading to an error. This phenomenon is widely known by the manufacturers and has been called ‘Single Event Effect’ (SEE), which, in turn, is classified in three basic categories: A soft error or ‘single event upset’ (SEU), a soft or hard error or ‘single event latch-up (SEL) and a hard failure or ‘single event burnout’ (SEB). A Single Event Upset happens when the flow of data (“1’s” and “0’s”) is corrupted, such as when reading the binary code from a memory or processor an extra bit is added or lost. This is a fairly regular occurrence and is usually corrected within the device by a special code that counts the number of bits, checks to make sure the same number was received, and orders them to be repeated if there is a discrepancy. A Single Event Latch is more serious. The external radiation causes one of the transistors to malfunction, allowing high voltage to enter the circuit and disabling the device either temporarily or permanently. The damage is usually localized and many critical circuits have built in redundancy to compensate for this. A Single Event Burnout results when the radiation causes instantaneous yet large voltages to enter the circuit, burning the internal elements of the transistors and their surrounding components. When this happens the electronic circuits are permanently disabled. All of the problems mentioned happen to semiconductor circuits when exposed to radiation. Manufacturers of commercial semiconductors do not design any protection against this and so our society — our way of life — is highly vulnerable. The protection from such things as solar radiation and cosmic rays has instead been to establish a conductive layer of metallic particles which cover and dissipate this radiation. In an Atmospheric Radiation Effects Whitepaper by Ken Vranish, titled “The Growing Impact of Atmospheric Radiation Effects on Semiconductor Devices and the Associated Impact on Avionics Suppliers” the problem is put in perspective. The design and manufacturing of complex devices usually allow for flaws and malfunctions that are tracked statistically. A failure or malfunction that happens once in 40,000 hours could be thought of as negligible. But if the malfunction is in a life critical system, such as the navigation or engine control of a passenger aircraft, this could be deadly. Next, complex designs usually take about a decade to reach production. The circuitry in use today was designed before the problem of radiation was well understood. So there is virtually no protection in individual circuits. This shifts the burden to a global solution, especially with regards to aviation electronics, such as atmospheric seeding with metallic substances. All of the above is especially true for military applications of semiconductors. No doubt the public will feel disrespected when they learn that this fact has been hidden from them. But perhaps they will also take note of the many unusual airline tragedies that appear to be the result of some sudden electronic failure. Perhaps they will understand why automobile manufacturers, like Toyota, have not been up front about the vulnerabilities of today’s fly-by-wire automotive controls that should have faraday shield, at the very least. With the Solar Maximum (the normal period of greatest solar activity over the sun’s 11 year cycle) approaching, we can expect more and more failures of semiconductors, resulting is all sorts of malfunctions and potential burnouts. One strong Coronal Mass Ejection is all the it would take to trigger the dire scenario portrayed by Major Miller. 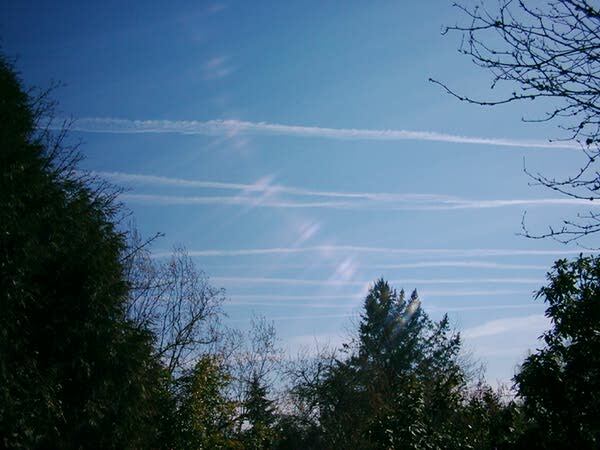 Back in 2001, angry citizens had mustered enough physical evidence and thousands of photos and video tapes to make at least one congressman, Mr. Dennis Kucinich, include the phenomenon in a bill, (HR 2977) “The Space Preservation Act of 2001″ where chemtrails were to be prohibited as an “exotic weapons system.” After some closed door discussions, the bill was re-introduced (HR 3615) with this portion of the prohibition omitted. Non-scientists have noticed that beautiful sunny days are often turned into overcast by the crazy zig-zag flights of jets and wonder if this could also cause droughts or respiratory illnesses. My own research shows that the medical practitioners I spoke to predict a huge rise in Alzheimer’s Disease thanks to the huge increase of aluminium in the atmosphere. In fact, I myself was tested for heavy metals and yes–my tissues are unusually high in mercury, barium and aluminium. If I am contaminated with these poisons, surely millions of other people are, too. That this is all allowed to happen without public consent is crazy, and yet NO government in the world will even address these issues. Which raises a hugely important question: why? Why won’t governments come clean with the chemtrails? We are being poisoned daily. Animals and plants are dying, and human health is suffering. No one knows the long term consequence of spraying toxic heavy metals in the atmosphere. Is need to shield military, corporate and business communications a higher priority than the wellbeing of the the planet and all living creatures in it? We think not! First, check your health–you may be surprised to find that you have absorbed far, far more heavy metals than you’d expect. We were shocked to find high levels in our systems, as mentioned above. Getting tested is easy: snip off a chunk of hair and send it here or here for analysis. Chlorella – Pulls heavy metals from tissue and encapsulates toxins to prevent reabsorption in the digestive tract. Pectin – Absorbs heavy metals in the intestines and assists with removal. Cilantro – Eliminates mercury, lead and aluminum from the body. Bentonite Clay – An excellent detoxifier of heavy metals. If you take it orally, be sure to only ingest the food grade variety known as calcium bentonite clay. It can also be used in the bath for gentle detoxification through the skin. Kombu seaweed – Rich in heavy metal-absorbing alginate. Activated charcoal – Binds to heavy metals for safe removal from the body. Ultimately, the discontinuation of spraying is the best protection against the health-ravaging consequences of chemtrails. Email or tweet your Congressman, MP or other local political representative this article and ask for answers. Spreading the word by sharing this post on social media and on blogs (you have our blessing) will also raise the alarm for others, which is essential: once the truth is out there and we, the public, show we’re not as stupid as governments think we are, these sinister, secret practices will have to stop. Previous articleLucid Dreaming: Can You Control Your Dreams? Next articleCern to Open/Contact parallel universe this week?